Last week’s Bay Area Rapid Transit (BART) strike created the world’s largest parking lot, as 400,000 commuters who usually ride BART trains each day sat in cars and buses trying to move through the gridlocked Oakland/San Francisco Bay Area. Last Friday, the two striking unions agreed to return to work for 30 days while negotiations continue. The unions—the Service Employees International Union and Amalgamated Transit Union—represent about 2,400 BART station agents, train operators, mechanics, maintenance workers, and professional staff. The unions have sought a wage increase of 23.5 percent over the next three years. Other key sticking points include employee contributions to pensions and health insurance. All sides agree they are far from reaching a deal and the unions could strike again after August 4. In the meantime, the public should take a close look at BART compensation figures. The table below shows the compensation breakdown for all 300 full-time BART station agents, who are union members and the public face of BART. The table shows the highest dollar amount paid for each category as well as the median dollar amount paid (half the station agents are paid more and half are paid less). The median base pay for station agents is $62,719. 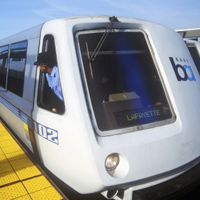 A 2005 study found that BART station agents receive the highest base pay of station agents in five metropolitan areas: Atlanta, Chicago, New York, San Francisco, and Washington, D.C. The table also shows that other cash payouts for such things as overtime and vacation increase the take-home pay for the typical station agent to more than $78,000 a year, a comfortable paycheck for a job that requires only a high school diploma or GED. But this amount doesn’t include benefits, which exceed $31,000 and alone is more than many BART riders’ yearly wages. Let’s look at the benefits breakdown. The employer’s contribution to medical, dental, and vision plans is $17,415, or 28 percent of base pay. Workers pay only a flat $92 monthly fee for family health insurance. Nationally, the average employee contributes nearly three times that amount for family medical insurance, according to the U.S. Bureau of Labor Statistics. Another $12,555 is paid by the employer for pension contributions, which includes $4,661 for the employee’s share. Yes, BART workers don’t pay a penny into their own CalPERS pension, a sweet deal unavailable to many Bay Area workers. Adding up the median amount across each compensation category yields a total of $111,793, but since nobody actually receives the statistical median across all categories, the actual median total compensation for BART station agents is $108,505—a comfortable living indeed. The pleas of poverty coming from BART union members should fall on deaf ears when negotiations resume Friday. BART employees are very generously compensated at a time when most Californians are still struggling to recover from the Great Recession. BART employees should stop holding the entire Bay Area hostage to their limitless greed at riders’ expense, but they should receive a competitive compensation package. This means freezing their base pay, expecting them to pay at least the national average for health insurance, and having them pay their full share of pension contributions, which would save the public more than $17 million a year. BART should function as dependable daily transit for 400,000 commuters, not as an endless gravy train for government union employees.